In common, the chemical reactivity of Group 14 elements increases down the group. Their chemical reactions are listed in the table shown below, followed by a brief explanation of carbides, halides, fluorocarbons, hydrides and oxides. M = Pb, Sn, Ge (slow); not Si. In case of lead, insoluble PbSO4 slows down the reaction. M ≠ Si, Pb. Ge and Sn give hydrated oxides. Fuming nitric acid renders lead passive. Not C, Ge, Pb; SiO32- is formed fast. Sn(OH)62- is formed very slow. Not C, SiO44-, GeO44-, Sn(OH)62-, Pb(OH)42- are formed. M = C, Si, Ge, Sn. Lead reacts slowly with cold, moist air. Whenever carbon is associated to elements of lower or approximately the similar electronegativity, the binary compounds so formed are known as carbides, example: CaC2, Al4C3, Be2C and so on. Though, compounds of carbon having hydrogen, oxygen, sulphur, phosphorus, nitrogen and halogens are barred from this definition. Based on the bonding between the element and carbon, carbides are categorized into three groups, that is, salt-like or ionic carbides, interstitial carbides and covalent carbides. Ionic carbides are made up by elements of Groups 1, 2, 3, 11, 12 and 13 apart from boron. Most of such are colourless and non-conducting in the solid state. These carbides are decomposed through water and dilute acids discharging either acetylene or methane. They are termed as acetylides and methanides, correspondingly. Most of the acetylides encompass cubic structure identical to the podium chloride structure. One cell axis is, though, elongated to accommodate the (C=C)2- ion making the symmetry of the crystal tetragonal and not cubic. 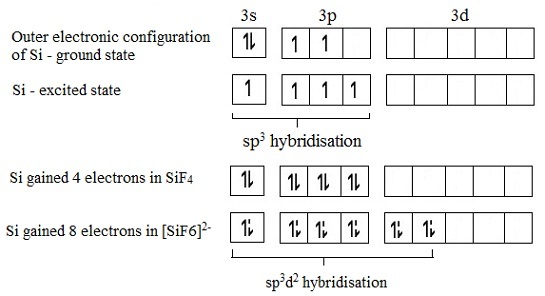 In the above table, you will notice that the coordination number of each ion is six. These are made up by combination of carbon by some transition metals like Ti, W, V and so on. Such carbides resemble interstitial hydrides. They are non-stoichiometric compounds. Carbon atoms are adjusted in the interstitial spaces of the metal lattices devoid of causing any appreciable distortion. At the similar time carbon atoms further stabilize the lattice, resultant in very high melting points, high conductivity and increased hardness of such carbides. The capability of carbon atoms to enter the interstices devoid of appreciably distorting the metal lattice needs that the interstices and therefore the metal atoms must be relatively large. Lattices of metals having atomic radius less than 130 pm get distorted, example - iron, cobalt and nickel don't form typical interstitial carbides. Their carbides are intermediate in properties between ionic and interstitial. The transition metals illustrated above have atomic radii 126, 125 and 125 pm, correspondingly. These are made up by combination of carbon with elements of almost equivalent electronegativity such as boron and silicon. Silicon carbide, SiC, termed as carborundum and boron carbide, B12C3 are huge macromolecules having covalent bonding all through. Both the carbides are extremely hard, infusible and chemically stable substances. Boron carbide is harder than silicon carbide and is employed as an abrasive. In the presence of alkali, the hydrolysis will be faster due to the stronger nucleophile, that is, OH, now available. It might be illustrated that in acidic solutions, water gets protonated and therefore doesn't remain an efficient nucleophile. Fluorocarbons are the synthetic equivalents of hydrocarbons in which some or all of the hydrogen have been substituted via fluorine atoms, example - CF4, C2F4, C2F6 and so on. Substitution of H by F greatly raises both the thermal stability and the chemical inertness due to the greater strength of the C-F bond and the bigger size of the fluorine as compared to hydrogen atoms. The bond energy of C-F bond is 489 kJ mol-1 compared with C-H bond energy of 414 kJ mol-1. Fluorocarbons are resistant to attack via acids, alkalis, oxidizing and reducing agents. Similar to hydrocarbons, fluorocarbons are able of forming carbon chains of indefinite lengths. They are not oxidized by oxygen due to carbon bonded to fluorine can be considered to be efficiently oxidised. Though, they are attacked via hot metals such as molten sodium. On burning, they split at C-C bond instead of at C-F bond. CF4 is the simplest fluorocarbon. This is a colourless gas obtained via the reaction of carbon tetrachloride having silver fluoride at 575 K. Perfluoroethane, C2F6, is analogous to ethane, C2H6. Tetrafluoroethene, C2F4 can be polymerized thermally or in aqueous emulsions to a chemically inert plastic, polytetrafluoroethene (PTFE), commercially termed as Teflon. Teflon consists of an extremely low coefficient of friction. This is employed as a protective coating in the non-stick kitchen utensils, razor blades, bearings and so on. Mixed chlorofluorocarbons like CC12F2, CFC13 and CF3C1 are termed as 'Freons'. They are volatile, thermally stable and chemically inert compounds having low viscosity. Thus, they are employed in refrigeration, in aerosol propellants and in heat transfer methods. CF3CHBrCl is a safe anesthetic. Each and every element in the group forms the covalent hydrides. The stability of hydrides reduces down the group, due to decreasing M-H bond energies. Therefore as CH4 and other alkanes are stable compounds, PbH4 has not even been appropriately characterized, so far. The availability of d-orbitals coupled by lower bond energy of the M-H bond makes hydrolysis of the hydrides of heavier elements simpler as compared to that of the alkanes. For illustration- methane doesn't experience hydrolysis at all due to non-availability of d-orbitals in C; however silanes do so in the presence of dilute alkali. Hydrolysis of the hydrides of heavier elements obeys a complex pattern based on the factors like stability of the parent hydride to side-reactions, such as oxidisability and so on. Each and every element in the group mainly forms mono and dioxides. The dioxides are all thermally stable apart from for PbO2, the reason being an increase in stability of +2 oxidation state down the group. Acidic character of the dioxides reduces down the group; CO2 and SiO2 are acidic oxides, whereas GeO2, SnO2 and PbO2 are amphoteric. Carbon is extraordinary in making gaseous mono and dioxides, CO and CO2. Carbon monoxide is acquired on passing steam over red hot coke. The product, a mixture of CO and H2, is termed as water gas and is employed as a fuel. Carbon monoxide is an odorless and colourless gas. Due to its lack of smell, it is extremely dangerous. Whenever inhaled it makes a very stable compound, carboxyhaemoglobin, with haemoglobin. The haemoglobin is the oxygen carrying protein in blood. Making of carboxyhaemoglobin prevents it from acting as an oxygen carrier and death eventually takes place from asphyxia. Carbon monoxide has decreasing properties. This is a significant reducing agent, reducing metallic oxides to the metals at high temperatures making carbon-dioxide. CO2 is a colourless gas having a faint smell. Its structure can be symbolized by O = C = O. This can be simply liquefied via application of pressure even at the ordinary ambient temperatures. If liquid CO2 is allowed to expand quickly, solid CO2 is obtained. Solid CO2 is recognized as dry ice. Whenever this is employed as a refrigerant, it doesn't pass via the liquid phase (cf., water). Solid carbon-dioxide is as well employed as a freezing mixture in the organic solvents such as acetone or methanol. In the presence of sunlight and chlorophyll, plants are capable to synthesize carbohydrates from water and carbon-dioxide. Silicon makes a significant acidic oxide, and an unstable monoxide, SiO. Germanium and tin make amphoteric oxides. GeO2 is mostly acidic, whereas SnO and SnO2 are amphoteric in nature, dissolving both in alkalis and acids. This can be supposed that the four singly filled hybrid orbitals are employed in making covalent bonds by four F atoms. The two vacant hybrid orbitals are employed in making coordinate bonds by accepting a pair of electrons each from the two F- ions. Though, once the complex is made the entire bonds become equivalent.